Noahpinion: Apple and Sony: an eerie parallel? Apple and Sony: an eerie parallel? Charts courtesy of Yahoo Finance, idea courtesy of my friend Dayv Wachell. 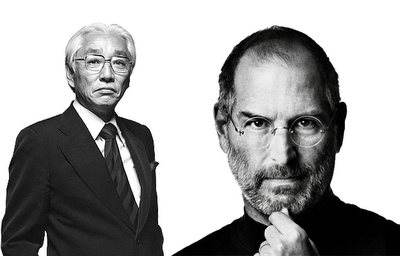 It's well known that Steve Jobs idolized Sony, especially its founder Akio Morita. Morita was a Jobs-like figure, maniacally focused on design and on pleasing the consumer (while his partner, Masaru Ibuki, the Wozniak of Sony, handled the initial technical wizardry), and loved by the public. Sony even inspired Jobs' wardrobe. There are other parallels. Sony's big break was a portable music device; so was Apple's. Like Apple today, Sony in the 90s was known for having cult-like fans in its domestic market; these "Sony-heads" would essentially buy anything that Sony put out, even as the company's image slipped internationally. I've even heard people allege that those fans provided the company with a profit cushion that allowed it to ignore problems on the horizon. In any case, when Sony's charismatic founder died, the firm was at the top of its game, and on top of the world. After Morita's death in October of 1999, Sony's stock price rose dramatically, only to crater a few months later. 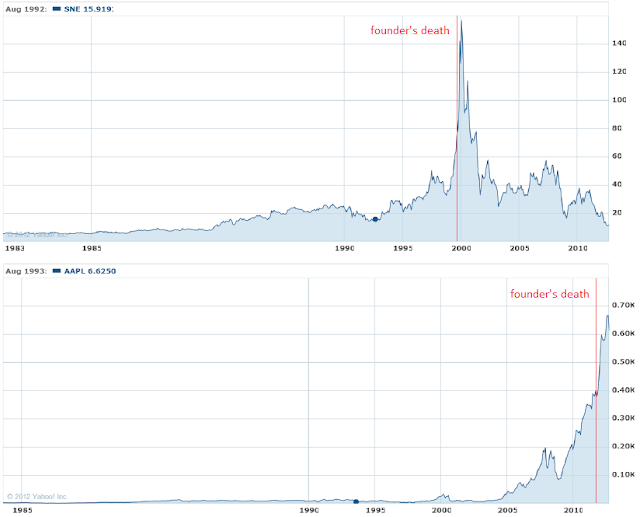 Since Steve Jobs' death a year ago, Apple's stock has soared. But is there a parallel here? Is Apple's recent downtick the start of the kind of epic fall suffered by Sony in 2000? If so, that'll be kind of neat. As I wrote at the top of this post, the point here is not to say "Apple = Sony! Sell!" Don't do that. (If you're interested in trading Apple stock, go be an Apple analyst; otherwise, keep your money in a nice diversified portfolio and trade only once per year.) The point is to wonder about the effects of iconic founders. Do celebrity founders who reach the iconic status of a Jobs or a Morita endow their companies with fat profit margins, by creating a group of super-fans who would pay $600 for a brick as long as it sported the company logo? Does a diehard core of super-fans lead a company to become complacent after the death of the iconic founder? 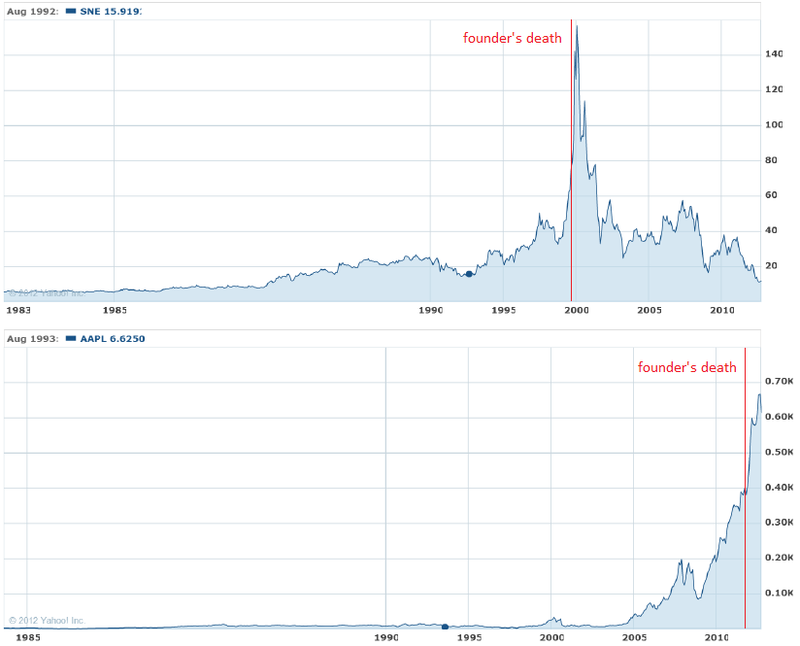 And does the death of an iconic founder lead to a predictable rise in a firm's stock price? Do investors implicitly believe - for a little while, anyway - that the "spirit" of an iconic founder lives on in the company he founded, causing them to overestimate the company's prospects, leading to a predictable crash in price? And can the timing of that price crash be predicted? The obvious rejoinder would be that quite a lot of tech companies peaked shortly after October 1999. (Including Apple, although that's been dwarfed by their recent growth.) There was a bubble going on at the time, after all. You might be able to say Sony's peak was especially sharp or something, but that would require more concrete analysis. I keep forgetting, did Sony have $120 billion in the bank in 1999? With a run rate adding $50 billion a year to he bottom line & a bunch of 3-5 year old products? No investor should give two shits about how when Walt Disney died, or JP Morgan died or George Halas died, the "magical vision" ended. These are coincidental factors to business practices that adapted or didn't and resulted in collapse. Come up with a REAL financial model, tell me who's going to beat Apple with a better customer experience or ecosystem and do your homework. Quit trying to be "that guy" after Apple declines 10%. Your homework can help people, but instead it's convincing people "they are right not to invest in this growing company". Quit trying to be right and tell them why to invest in something! You take yourself VERY seriously. Killjoy! Yeah! As mentioned prominently at the start of the post, this was supposed to be a break from real econ blogging.... and here you are demanding "REAL financial models," as if reveling in amusing speculation about the ghosts of founders isn't an end in itself! Who do you think your are, Killjoy!? Morita passed away when Sony was past its prime. Sony failed to put together a strong ecosystem. After the Betamax debacle, Sony bought Columbia Pictures in the hope that a content foothold would help it drive standards. It didn't work, and Sony developed a bad tic of trying to push standards no one else bought into, trying to be a premium brand in competitive markets with no differentiators, or BS proprietary ones. Apple, on the other hand, lost Jobs at the height of his powers, and has a very strong culture and ecosystem of developers driving a new mobile/cloud platform which is still in ints infancy. So far, despite repeating the Mac strategy of a closed, premium, strongly branded platform focused on ease of use and design, they have managed to avoid losing out to a commodity platform. Unlike the Windows era, they have the apps edge. Also, unlike the Windows era, it's a consumer buy, not an IT buy, and Apple has the edge with their brand and their stores. In the long run, though, unless they not only maintain the edge over Android, but keep extending it into new products, TV, payments, etc., there's a chance you may be right. We have an iMac with which I am profoundly unimpressed. It's 4 years old and needed a hard drive replacement. All of this is strongly negative. But my experience at the Apple store was amazing, and the place was crawling with customers. It reminded me of an ant hill. There is a lot of strength in that retail experience. In the case of Apple I suspect the spike is more closely related to the apparant ability to deliver to Jobs's high standards after he was no longer around to guide the company. The fall, if it comes, will be because the company isn't able to give its customers what Steve Jobs was able to give them. Morita stepped down as Sony chairman five years before he died, due to his own failing health; he appeared to have little involvement in the company in his final years. Apple may well be headed for trouble eventually, but I doubt that it would happen this quickly. "I don't have enough bandwidth to be your exocortex"
Wow, you are one arrogant dude. Do investors implicitly believe . . .
Noah, you should take 2 or 3 days and work out some wonkish formula that splits stock prices into its component parts (how much merely reflects the fact that every day so many doctors put X dollars into their pension plan that has to be invested while at the same time people buy and sell on news reports, factually unworthy of People magazine or the Star, that this time it is different, there is a culture, it will live on, etc.). This is not a serious suggestion, but look at all the funds that push their computer program. (1) Steve Jobs was as fascinated by the fall of Sony and HP and Polaroid as he was fascinated by Morita, Packard and Land. He also knew he was dying for a long time. He spent much of his last years attempting to institutionalize the mindset of innovation into Apple itself and is often cited as saying the company was the product he was proudest of. (2) The decline of Sony started as soon as they become a big content company. Consumer facing things like itunes and the ipod simply could not have been made at the new Sony, bestie to all things DRM. Their one bright light over the last 15 years has been the Playstation business and even this is currently in shambles because of overreach for DRM's sake. The faster Apple goes away, the better. Noah, a micro economist would look at Apple and say it cannot last for it has no sustainable competitive advantage. Such an economist would also calculate how much of Apple's profits flowed from it being a first mover. In a 2007 email, Google's Eric Schmidt, above, was asked by Steve Jobs not to recruit an Apple engineer. "I would be very pleased if your recruiting department would stop doing this," Jobs wrote Schmidt, then-CEO of Google who also sat on the Apple board. SAN FRANCISCO -- Apple, Google, Intel, Pixar and other high-tech companies will face an antitrust lawsuit that alleges they illegally conspired not to poach each other’s staffers. San Jose U.S. District Court Judge Lucy Koh rejected a motion to dismiss the claims Wednesday night. In a 29-page opinion, she ruled that the “Do Not Cold Call” agreements among the defendants probably resulted “from collusion, and not from coincidence. This was a good post, unfortunately spoiled at the end by your implicit endorsement of the EMH. Unless it was tongue in cheek, in which case, good on you. I would strongly urge Noah and you to go the SSRN website and download a paper by Michael Jensen, Remuneration: Where we’ve been, how we got to here, what are the problems, and how to fix them. Start at page 85, How Markets Reward and Punish Managers and read forward, and see how Jensen explains that compensation turns managers into unethical crooks. Look especially at the graph on page 95. Since reading the paper and talking with Jensen in 2004 I have been convinced that the reason the American economy is broken and has been since the 1970s is the fundamental dishonesty lying at the core of the stock market and American business. Jensen's paper explains why our firms don't work. Apple has been an exception because, until Jobs died, it was a pretty honest firm. Now, you can see it has already changed for the worse and anyone can witness the interplay between the company and the market. Jensen's work used Microsoft, as I recall. Really glad that you blogged about Apple, I also think we will see a reversal in it's fortunes but for two different reasons. 1) The popularity of Apple's products appears to have much to with trendiness/coolness. Now some companies can stay 'cool, but…for want of a better turn of term…you can't stay at 'peak cool' forever. Once the core trendsetters move away from Apple's products consumers will migrate to the next hip product. I Malcolm Gladwell's work on epidemics in 'The Tipping Point' is relevant to Apple, thus I think their products demise will mirror other products whose popularity was based on a 'fad' i.e. Hush Puppies shoes. 2) The standard organisational effects of being a market leader i.e. complacency (see Microsoft and indeed Sony). Seems like a pretty big oversight to not mention the general stock boom of and bust of the late 1990s. You see a similar pattern in most tech stocks in 1999, including microsoft, for example, although not necessarily that pronounced. Also, I don't think your graph of Sony's share price is technically accurate, since it isn't adjusted for splits and dividends (or is it? I have a hard time with Yahoo Finance because its never clear what you are looking at, and often their data is just wrong...). At any rate, yahoo states that there was a stock split shortly after Morita's death and before most of the decline in Sony's share price. Yahoo is adjusted for dividends. Not sure about splits off the top of my head...Can you find a chart that includes splits for sure? That would be awesome. I checked and it turns out that your data is actually adjusted for the split as well. Without adjusting for the split the spike around Morita's death is actually much, much bigger. "Is Apple's recent downtick the start of the kind of epic fall suffered by Sony in 2000? If so, that'll be kind of neat." That would be kind of neat! For several years I've had a wild fantasy of striking my fortune by short selling Apple for all I'm worth at just the right moment! They are just too cool man. You can't keep cool in the long run. And they are mean, secretive, closed, expensive, and controlling. If Apple could be your friend, would you want that kind of friend? Alas, even your eerie and interesting post doesn't give me sufficient courage. They just make too much money. I guess my well-diversified portfolio will stay just as it is, and we can return to this amusing post to cry away our almosts when you prove to have perfectly predicted the collapse of the world's biggest, and coolest (and most profitable?) company. Hot stock tips, etc, but I cautiously endorse what Noah is suggesting in this post. AAPL's rise is chimerical. It is mostly relatively unconsolidated flow. Everything at the razor's edge technologically speaking is. The solid long-term business AAPL has is selling workstations to businesses and creatives. That is not going anywhere. The drastic revenue growth is all coming from the razor's edge, and unless iPads and iPhones are to become a stagnant (perhaps mature is a better word?) standard (in form, in function, etc), there is every chance that a smaller, lither competitor will put AAPL to the sword with a new disruptive form or function. I love metaphors that involve swords. Americans are way behind our British cousins in this regard.